On the shelves of Loeb Music Library lie treasures. 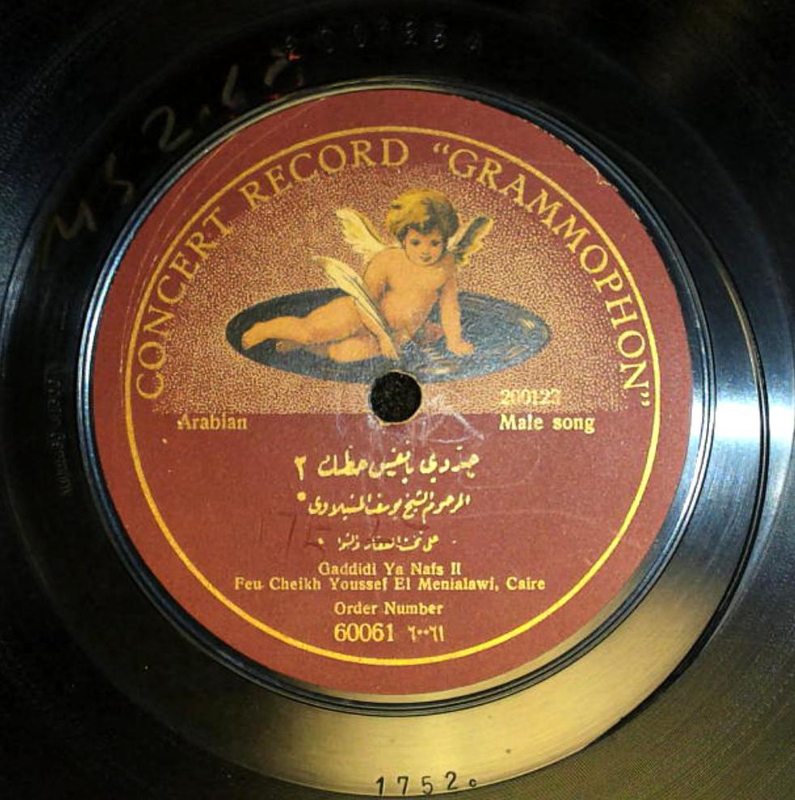 The 78rpm Arabic records collection is only one of many. 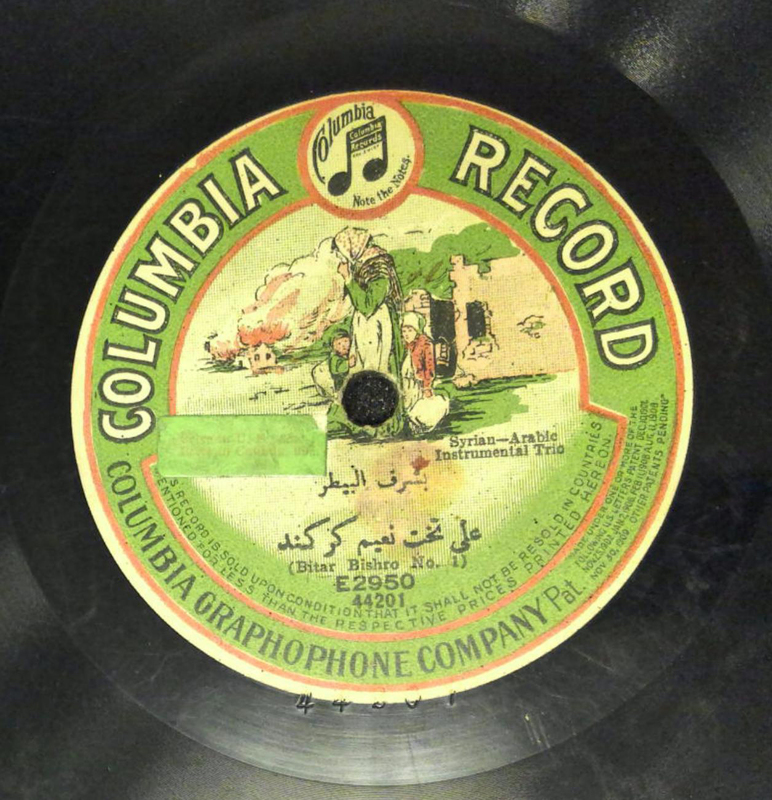 The collection contains over 600 records belonging to the Nahḍah era (Arab renaissance) of the early twentieth century. The recordings represent voices and instruments that shaped the music scene and aesthetic taste during the period between 1910 and 1950. 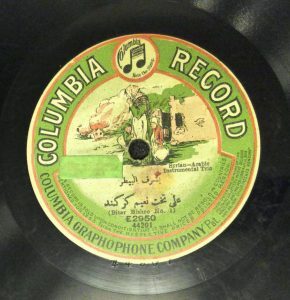 The collection joins another of newer Arabic LP records. 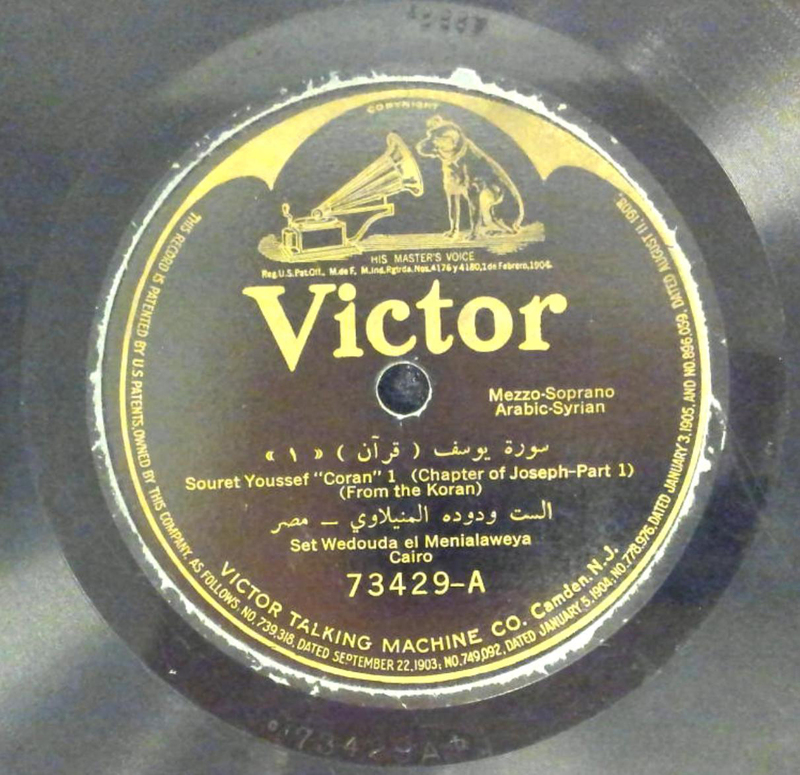 The discs feature recordings of famous performers and composers who are recognized for their distinguished contribution to Arabic music, such as vocalist Yūsuf Al-Manyalāwī (1847-1911), Sayyid Al- Ṣaftī (1875-1939) who was nicknamed the master of dawr (a form of Arabic music), Umm Kulthūm (1904-1975), and Faraj Allah Bayḍā, who established Baidaphon records company, the first of its kind in the Arab world in early twentieth century. It also features shadowed and forgotten voices such as Aḥmad afandī Al-Mīr, Naʻīm Samʻān, and many others. That era also marks the first recordings of women vocalists such as Munīrah Al-Mahdiyyah (1884-1965), ʻAliyā Al-Aṭrash, and Laure Daccāsh. One of the most important names of that period was the violinist Sāmī Al-Shawwā who introduced the violin to the traditional Arabic music ensemble (takht). Al-Shawwā performed with Yūsuf Al-Manyalāwī and Abd Al-Ḥay Hilmī whose voices were preserved on Gramophone Monarch Records and famous Baidaphon records. 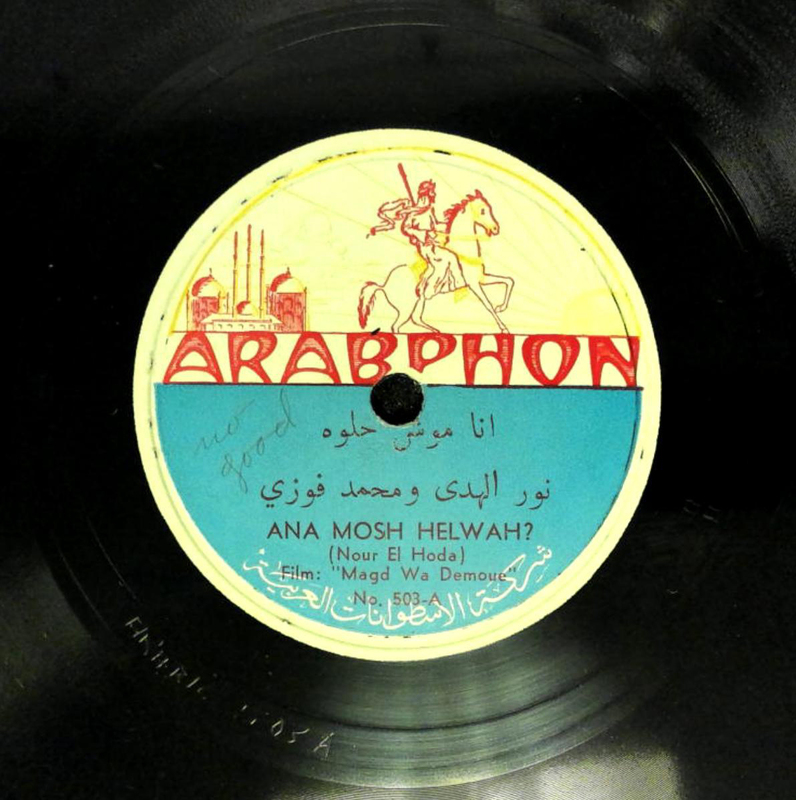 Arab record companies, such as Baidaphon and Cairophon, are only a few among many other American (Columbia, Victor), European (Odeon, Orfeon), and Arab-American companies (Al-Chark, Alamphon) that recorded and released these notable Arab voices. Songs and performers from Egypt, Syria, Lebanon, Palestine, Iraq and Al-Maghrib exhibit the rich tradition of Arabic musical forms, namely the art of al-mawwāl (vocal improvisation), qaṣīdah (sung poems), muwashshaḥ (Andalusian sung poetry), ṭaqṭūqah (pop songs) and taqsīm (instrumental improvisation. 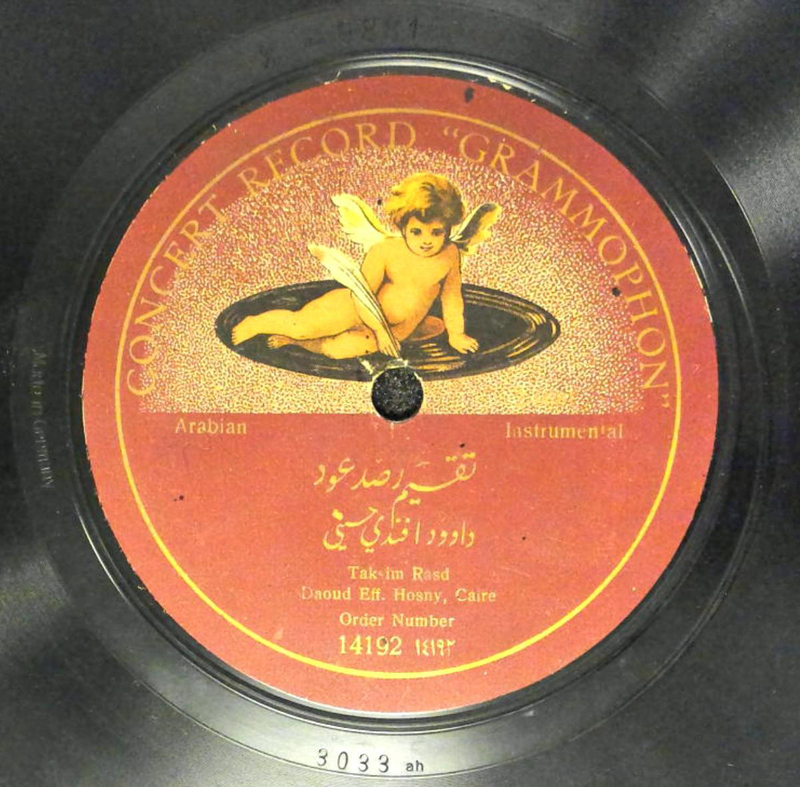 Religious chants are also an important piece of the Arabic musical tradition. The collection includes Qur’anic recitation of Al-shaykh Ṭāhā Al-Fashnī and a rare record of a woman reciter Wadūdah Al-Minyalawī alongside Christian hymns of Father Gigis ʻAzīz Al-Jizzīnī. Many items in the collections are rare and show distinctive inscription and information. What stood out the most was the first recording of plays’ songs in urban Cairo especially those performed by Salāmah Ḥijāzī (1852 – 1919). 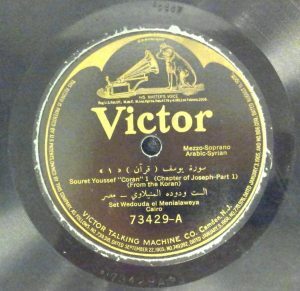 As soon as cinema was introduced to Egypt, recordings of the films’ songs were also released. Acquired over a period of ten years, the Arabic 78 Collection joins the increasing yet still limited interest in the preservation of early Arabic music recorded heritage. Individual donations to the collection include the notable personal collection of Boston-based expressionist visual artist Kahlil George Gibran (1922-2008). The Archive of World Music is a special collection within the Loeb Music Library. Many of its rare and fragile recordings (other than commercial CDs, VHS tapes, and DVDs) must be reformatted for research use. Requests for in-library listening copies of recordings may be made at any time, but require one week to prepare. To make best use of your time at the Archive, please contact Peter Laurence, Curatorial Assistant in the Archive of World Music, in advance. رفوف مكتبة لوب مرتع لكنوز فكرية وموسيقية. مجموعة أسطوانات جرامافون العربية هي واحدة فقط من بين العديد من الكنوز. تحتوي المجموعة على أكثر من ٦٠٠ اسطوانة تعود إلى حقبة النهضة العربية في أوائل القرن العشرين، كما أنها تشمل تسجيلات لأصوات وآلات شكلت أساساً للحياة الموسيقية والذوق الفني لفترة ما بين ١٩١٠ و١٩٥٠. تضاف هذه المجموعة إلى نظيرتها من الأسطوانات العربية الفينيل. الأسطوانات تحفظ تسجيلات لمطربين وملحنين ذاع صيتهم بفضل مساهمتهم الموسيقية. نذكر منهم: الشيخ يوسف المنيلاوي (١٨٤٧ – ١٩١١)، سيد الصفتي (١٨٧٥ – ١٩٣٩) الذي لُقِّب بسيد الدور، أم كلثوم (١٩٠٤ – ١٩٧٥)، وفرج الله بيضا الذي أسس شركة بيضافون للإسطوانات التي تعتبر الأولى في مجالها في المنطفة العربية. كما تضم المجموعة عدداً من الأسماء اللامعة المنسية، منها: المطرب أحمد أفندي المير، المنشد نعيم سمعان وغيرهم. من أهم فناني تلك الحقبة كان الكمنجاتي سامي الشوا الذي بفضله أصبحت آلة الكمان من الآلات الرئيسية في التخت الشرقي العربي. اصطحب الشوا الشيخ يوسف المنيلاوي وعبد الحي حلمي في حفلاتهما التي سجلت على اسطوانات شركة جراموفون مونارك. شركات الإسطوانات العربية كشركة بيضافون وكايروفون هي فقط بضع شركات إنتاج أضافت جهوداً اعتنت بتسجيل التراث الموسيقي إلى جانب شركات إنتاج أميركية (كشركة كولومبيا) وأوروبية (أودييون وأورفيون)، وعربية-أميركية (الشرق، الأهرام). مطربون ومؤلفون من مصر، سوريا، لبنان، فلسطين والعراق مثّلوا تنوع وغنى التراث الموسيقي العربي عبر فن الموال، القصيدة، الموشح، الطقطوقة والتقاسيم والإرتجال. التواشيح والتراتيل الدينية بدورها أيضاً من أهم الأشكال الموسيقية العربية. فالمجموعة تضم تسجيلات لكبار قرّاء القرآن كالشيخ طه الفشني وتسجيل نادر لقارئة القرآن ودودة المنيلاوي صاحبة الصوت الشجي الذي تتناغم عذوبته مع تراتيل الأب جرجرس عزيز الجزيني. العديد من أسطوانات هذه المجموعة نادرة وتحتوي على أقصوصات وعلامات مميزة. أكثر ما يجذب الإهتمام هو التسجيلات الأولى لأغاني المسرح الغنائي القاهري الذي كان سلامة حجازي من رواده. كما أن بعض أغاني الأفلام الأولى حفظت على هذه الإسطوانات كأغنيات نور الهدى (١٩٢٤ – ١٩٨٨) في إطلالاتها السينمائية الأولى. مجموعة الجرامافون العربية تنضم اليوم إلى الجهود المتزايدة المعنية بالحفاظ وتوثيق التراث العربي الموسيقي. التبرعات الفردية للمجموعة، كالتي قام بها الفنان التشكيلي اللبناني الأصل خليل جورج جبران (١٩٢٢ – ٢٠٠٨)، تبقى من أهم المصادر التي تساهم في بناء مجموعة الأسطوانات وغيرها.